I have long thought that I could try as a thread, thinner than the DMC cordonnet # 100. I came to want to try the thread “fil à gant” of Sajou. It is presented as a 120-size thread, but I must say that the difference in size with the DMC cordonnet # 100 is very important. 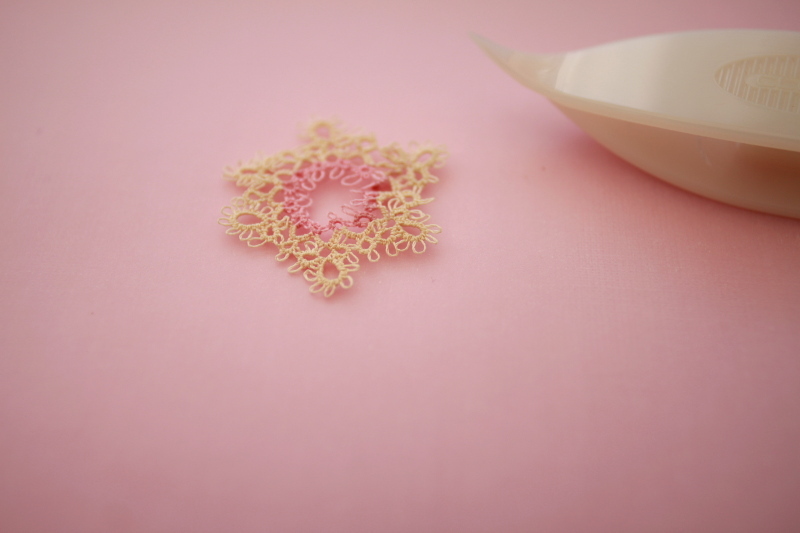 After the surprise of the size of the thread, I was reassured by its strength: the “fil à gant” is very thin, however, we can shoot enough to make shuttle tatting. Second concern, how to finish? My needle ball point seemed too big, and finishing tests with a miracle thread have failed. I finally found a pearl sewing needle that suits. I still need to practice a little before getting a nice result with this thread. But I hope to make it happen.